Visions like this should be used creatively by animal campaigners to push back against hunter propaganda, for example. The material is there. But the ineptitude of animal campaigners, especially the big orgs, is simply embarrassing. A disgrace. The images in this video are eloquent, so I will add nothing along those lines. But think of this: The world is still crammed with countless moral imbeciles who get their kicks killing these creatures. In the USA it is a huge community of depraved bastards with a huge industry behind them, a vociferous gun lobby, and a pliant, worthless and utterly prostituted political class and media. Don’t get me wrong: I’m NOT a liberal. I am not seeking a ban on guns as that is a useless and unenforceable pursuit in a nation like the US. That train left the station a long time ago. And frankly I don’t like the notion of disarming the citizenry, especially when the corporate-sponsored police state is growing by leaps and bounds, visibly and covertly, right under our noses. What I am against is for humans to train their guns (and bows and arrows and other pestilential forms of weaponry) on helpless animals minding their business in a dwindling natural space. All to get some cheap kicks. A “legal crime”—how’s that for a glaring oxymoron— defended by a multitude of largely unchallenged baloney. OOne of the million reasons why the squandering of media time on crap—political lies and cheap escapism— is a huge tragedy for humanity and those weaker species who depend on it. Meanwhile, visions like this should be used creatively by animal campaigners to push back against hunter propaganda, for example. The material is there. But the ineptitude of animal campaigners, especially the big orgs, is simply embarrassing. A disgrace. 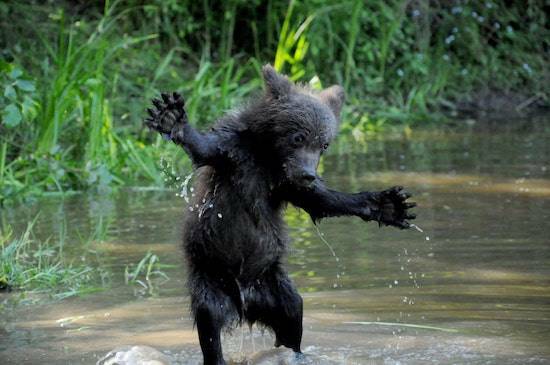 An orphan brown bear cub, named Borya, plays in a stream. The cub, along with a sibling, was rescued from the side of the road and eventually taken to the IFAW Bear Rescue Center in Bubonitsy, Tver Region for rehabilitation and release to the wild.